State Championship | Dax Myhand "the Legend"
Posted in: Basketball, Character, Coaching, Development, High School Boys, Skills. Tagged: Brewers, Christian County, KHSAA, Marshall County, State Championship. Barney Thweatt is the common thread that ties a tradition of great Marshall County Basketball to the powerhouse known as the Christian County Colonels. Success has been a constant companion of Barney Thweatt. 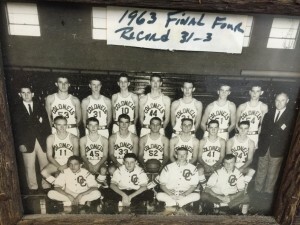 Barney Thweatt was a member of the 1947 State Runner-up and 1948 State Champion Brewers Redmen team. Barney’s team was ranked number one all year and went undefeated in 1948. 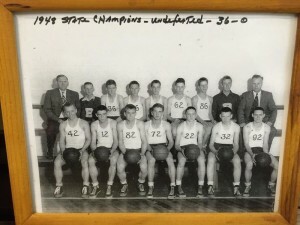 In fact, Brewers is the last undefeated Kentucky Boys High School Basketball team to be crowned State Champions. In this interview you will discover the common bonds of these two legends and how their paths intersected at pivotal moments. Posted in: Character, Coaching, Development, High School, High School Girls, Life Sport, Middle School, Middle School Girls, Mountain Biking, Skills. Tagged: Beckett, NICA, State Championship, Tennesse MTB. Posted in: Baseball, Character, Coaching, Development, Football, High School Boys, Skills. Tagged: Hall of Fame, KHSAA, Paducah Tilghman High School, State Championship, University of Kentucky, University of Louisville. Randy Wyatt is a Paducah Tilghman High School coach that has won multiple KHSAA State Championships in multiple sports as a coach and an athlete. Randy describes the mindset that is required to win championships. He provides insights from his early influences on his career. Many coaches and players excel in a single sport. But Randy Wyatt has a resume that is in very select company by winning championships in football and track as a coach and dominating his track events as an athlete. What does it take from a player, parent and a coach to bring home championships? It is probably not what you think.